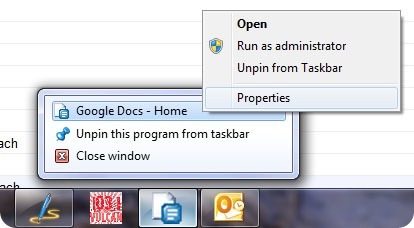 Some have come up against an aesthetic challenge to embracing Google Chrome’s fantastic “Create Application Shortcuts” feature. The trouble is that when you create an application shortcut for a website using Chrome, the program assigns it the “favicon” of the linked website for the Windows icon—and favicons don’t tend to come in any pretty high-resolution varieties, as they are intended to be displayed next to the web address in the browser, inside of a very small space. These icons are fine in the Start menu, where small icons are used anyway, but for the desktop or the Windows 7 taskbar, they can be pretty ugly. When I set out for a solution, I found mostly confused discussion. So, I worked out my own solution, a workaround, which I’m going to share with you now. You will need to find an icon that you would like to use. I great resource that I’ve found for high resolution, quality icons is IconArchive. I always go there first for icons. The icon I will use in this tutorial is from the Delikate icon set, by artist Kyo-Tux. It is located here. Wherever your icon comes from, it will need to be a file with the extension “.ICO”. Now, locate the shortcuts you want to edit the icon for. I usually don’t bother changing the icons in the Start Menu, but you can if you want to, using the same method described here. Then, click “Apply” (not “OK”) in the “Properties” dialog box. What? Why are you giving me that look? What’s wrong? What do you mean the icon didn’t change? Well, you must have done something wrong; I don’t know what to tell you. Just try again, I’m sure you’ll get it right. You seem smart enough, and I believe in you. Alright, alright. Don’t freak out; this is easy enough. You just need to restart Windows Explorer (the “program” that is the Windows interface). That may sound scary, but it’s not as bad as it sounds. Before we do this, though, I need to warn you that you should read through the entire tutorial before continuing. This is because while Explorer is closed, you will not easily be able to switch between windows to return to the tutorial (you can still switch between running applications using Alt-Tab or, in Windows 7, Windows Key+Tab, if you just don’t trust your own memory to get this right). Okay, let’s do this. 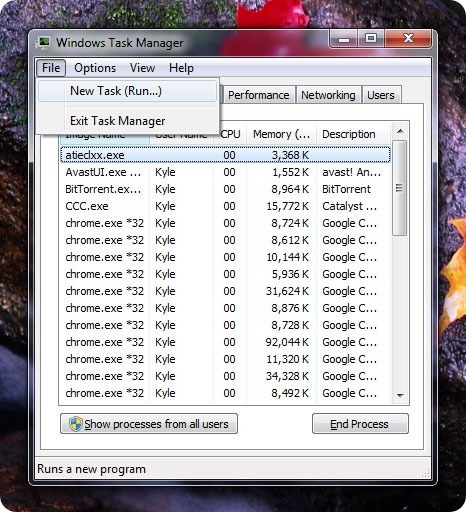 Press Ctrl+Alt+Del, and choose Task Manager (you know, like you’ve done 87% of every time you’ve ever used Internet Explorer for something other than downloading Chrome or Firefox). 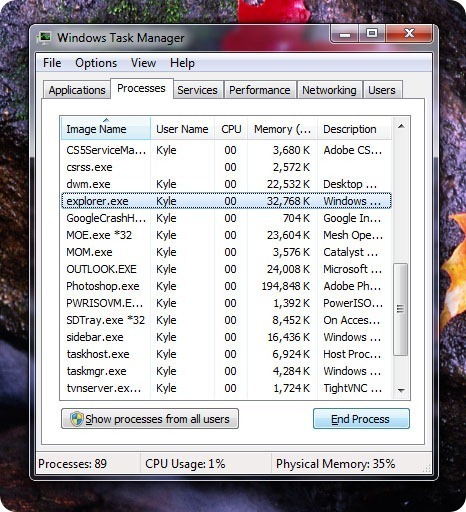 In Task Manager, switch to the “Processes” tab. Locate “explorer.exe” in the list, select it with a single left-click, and click “End Process.” Next, laugh maniacally, relishing your dominance over Windows. Again, laugh, but this time with an air of relief. Your precious desktop and taskbar have returned, just like Einstein in the first test of the DeLorean, as if they were nothing happened. Well, any previously opened folders are now gone. Sorry about that. But otherwise, all is well. 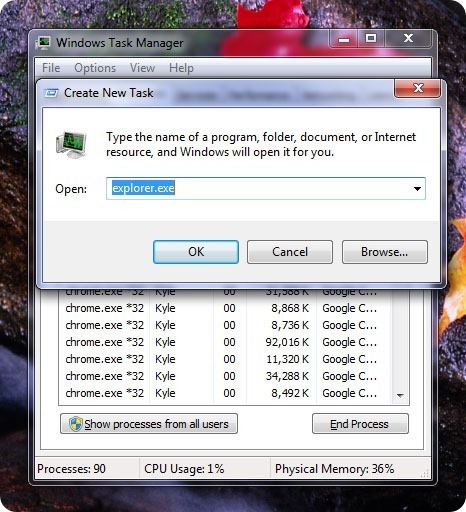 You can close the Task Manager now. Next, direct your eyes to the shortcut that got you into this whole mess. You should be pleased to find it now updated with the high resolution icon of your preference. Oh, by the way, in case you were curious, the icon you saw next to the Google Docs shortcut I used for the tutorial was one I created for my application shortcut to a Birmingham, AL radio station, 103.1 The Vulcan. If you want to listen, dial in to 103.1 FM in Birmingham, or check out their site from anywhere in the US. If you’re interested in the icon I created, I used the free Photoshop plugin from this Australian website. 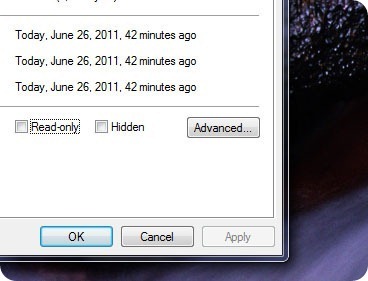 The icon file itself is attached at the end of this entry. Please post any questions you may have in the comments, and I’ll try to help in any way that I can. Right-click and use “Save As” to save a copy of this icon file.